Peter Treadway heads a team of talented engineers at ACTON Inc on a mission to transform the way we get around with their insanely fun, wearable personal transportation products. Their innovative RocketSkates are becoming wildly popular and have been making huge waves worldwide. They’ve been featured on a number of TV shows even before entering the Shark Tank, and have received a ton of well earned publicity and glowing reviews from customers. RocketSkates look irresistibly fun and they are certainly one of the coolest products in Shark Tank history. RocketSkates are the world’s smartest and most powerful electric roller skates. These beautifully designed motorized skates can support up to 275 lbs, and are electrically supercharged by a lithium ion rechargeable battery. RocketSkates connect to a robust mobile app with tons of features that can do things like monitor battery life, control skate settings, tell you how fast you’re moving in real time, track your route, measuring distances traveled, optionally steer with your phone, connect to the RocketSkates global riding community, and even has a built in function that allows you to lease your RocketSkates to other people, for an hourly or daily rate that you set, which means they can potentially pay for themselves. This modern take on a traditional method of personal transportation (and sport – Rocket Skate hockey anyone?) can zip you around at 12 mph (the legal speed limit for this type of transportation in the US) and can carry you as far as 10 miles! RocketSkates operate with 3 basic speed settings, beginner, normal, and pro. You can fine tune your speed while riding by simply tilting your foot. The more forward you tilt your toes the faster you’ll go, reaching top speed when your foot is parallel to the ground. The further you lean back on your heels the slower you’ll go. RocketSkates can carry you uphill with a maximum incline of about 8%, and you can easily travel downhill with great control by using the heel brake. They strap comfortably over your shoes and are stable and relatively lightweight at about 7.5 pounds, allowing you to move your feet as you normally would, even walk up stairs while wearing RocketSkates. They fit women’s shoe sizes 6 and higher, and men’s shoe sizes 6.5 and higher. RocketSkates are currently available in 3 models, the R-6, R-8, and R-10. The R-6 costs $499, can support 250 lbs, gives you a range of about 6 miles on a full charge, and recharges in just 90 minutes using a standard wall outlet. The R-8 is $599 and can handle more weight at 275 lbs max, has a range of 8 miles, and charges in about 2 hours if the batteries are completely drained. The R-10 is the top dog at $699, 275 lbs max weight, and charges in about 2.5 hours but can carry you up to 10 miles on a single charge. 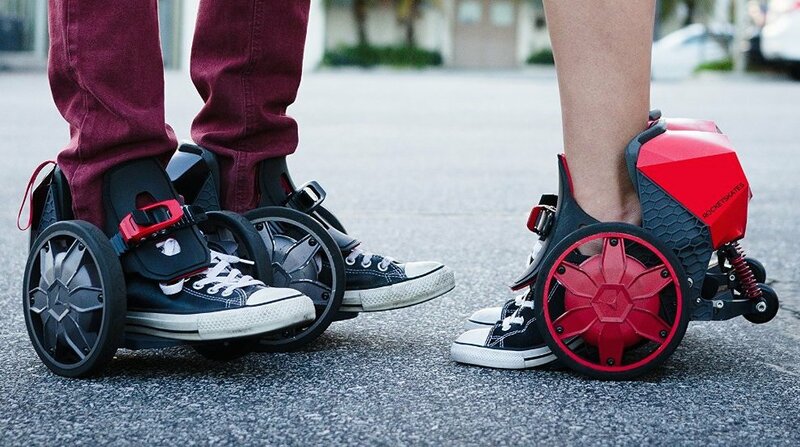 If supercharged skates aren’t your style, you can go with the M-Scooter, a compact and lightweight (72 lbs) personal scooter you can ride sitting or standing, and easily fit in your closet or car. This 3 wheeled electric vehicle comes in white or black and can carry a 350 lbs person up to 28 miles on a full charge from a standard wall outlet. The M-Scooter is powered by a Lithium-ion Polymer battery, can travel up to 12 mph in high speed mode and 5 mph in low speed mode, and is designed for indoor or outdoor use on surfaces like gravel, dirt roads, grass, and carpet. The M-Scooter has a retractable seat that folds away into the frame if you prefer to stand, and the frame itself can be collapsed to 50% of it’s expanded size, making it small enough to tuck away under a desk or in your car’s backseat. The M-Scooter has brakes on all three wheels, making it easy to stop quickly if needed, and features bright LED headlights. A full charge can take 2-5 hours, and the long lasting battery can take more than 500 charges before any degradation of charge capacity occurs, which is a problem with other battery powered machines. You can accessorize your M-Scooter with an optional cup holder, cargo basket, tow hitch, trailer, and phone mount. ACTON Inc has more personal transportation products in the works including skateboards, and we’re excited to see what’s next in this innovative line of futuristic products. You have to own a cell phone? You have to connect to Internet ? You have to have a blue tooth on cell phone! You have to risk your cell phone to skate! Your risk others and yourself when looking at cell phone? No, you don’t have to pair the skates with your phone, it’s just an option. They can connect, if the rider wants to use the app to see things like distance traveled.